The professional house painters at Sharper Impressions have 25 years of experience as a top home painting company in Powell and surrounding areas such as Dublin, Delaware, Lewis Center, Worthington, and others. We strive to offer painting services to meet our clients’ unique needs and lifestyles; from interior and exterior painting, to wood and drywall repair. We offer all types of exterior house painting, staining, deck and fence sealing, pressure washing, caulking and rotted wood replacement. Our home interior painting services include painting for walls, trims, doors, windows and ceilings. Count on our paint color expert to help you select the perfect shade to suit your home. It couldn’t be any simpler: Request a free house painting quote online and our team of dedicated Powell Ohio painters will get started on your painting project in no time. Sharper Impressions is committed to working in a timely and hassle-free manner by adhering to a customized schedule that fits into your busy lifestyle — no deposit required. Experience – Our professional house painters have been painting homes and businesses professionally for over 25 years. Local – Our corporate offices are located close to Powell in Plain City Ohio. Small, Hands-On Painting Company – We can be easily reached by phone with any questions you may have. Free Color Consultation – Our expert paint color consultants will visit your home for a free in-home color consultation. Let our local Powell painting experts help you! Free, Fast Quotes – Our computer-generated quotes are printed in 10 minutes and hand-delivered to you. EPA Lead Certified – We are an Environmental Protection Agency Lead-Safe Certified Painting Company. We keep you and your home safe during any painting project. Green – We purchase and use Low VOC paints to ensure that gases released when the paint dries are not harmful to you, your family, or our painters. 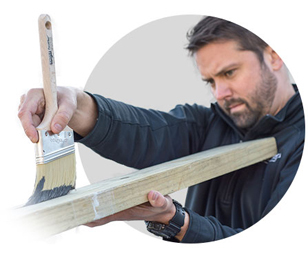 Community Involvement – We commit to volunteering our painting services to non-profits and support various charities around Powell and Central Ohio. Ever since the beginning, our goal has been the same: to make our customers fall in love with the color of their homes over and over again. And that is the Sharper Impressions Painting Company difference. Powell is one of the fastest-growing suburbs in the state of Ohio. Offering the charm of small-town living with the benefits of big-city attractions, Powell is located just minutes from Columbus. Powell’s rich, local history, wide variety of outdoor activities, and plethora of unique shopping and dining experiences make us proud to serve Powell homeowners and businesses. Take the family to the Columbus Zoo and Aquarium — the #1 zoo in the nation! Looking for professional house painters to give your home in Powell a fresh look? Call Sharper Impressions Painting Company today to schedule a free estimate, or request a free quote by filling out the form below!